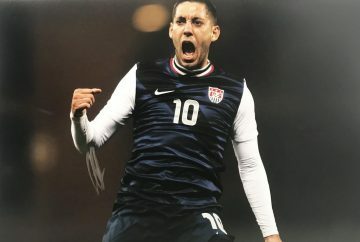 Shop for signed USA football team memorabilia including football boots, shirts and autographed photographs. 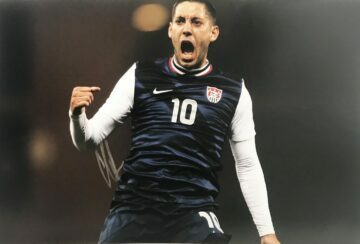 Most items come with a photo of the signing, All American signed soccer team items come with a certificate of authenticity, free UK delivery and fast worldwide shipping. Widely known as soccer in the US, football has over the years been overshadowed by more high-profile sports such as baseball, basketball and American Football. Yet it is a sport that grows in popularity year on year, with national audiences now starting to rival those of the country’s more prolific sporting events. Football is now the fourth most popular sport in the USA and the second fastest growing sport behind Lacrosse – with Major League Soccer games attracting huge audiences and TV coverage nationwide. Soccer has a longstanding history in the US which predates many of the other more popular sports played there today. Native American tribes played a variation of football known as ‘pasukuakohowog’ – literally translating as ‘the kicking ball sport’. The modern version of the game has been played there for many years, introduced when the British arrived on American shores and established townships and colonies. Most recently its origins have been traced to New Orleans, where Scottish, Irish, German and Italian immigrants began to play the game in an organised fashion. Competitive, professional leagues began to form during the 1800s, and soon football became a professional sport in its own right. As US football leagues grow in popularity general enthusiasm for the sport has followed suit, resulting in the development of homegrown interest and talent. Notable clubs include LAX, Chicago Fire and New York Red Bulls which over the years have attracted world-class players including David Beckham, Ashley Cole and Wayne Rooney. Soccer is widely played in schools, with over 4 million players registered across all 50 states. Firma Stella’s top-flight collection of signed USA soccer shirts, balls, boots & photos includes something for everyone. These valuable collector’s items have been hand-picked for their quality and authenticity.